This series will not repeat the basic Windows image build steps that have previously been described in my Working With The Microsoft Deployment Toolkit (MDT) 2013 series, but rather, will explore any changes or new features with the product. Firstly, in order to fully use the Microsoft Deployment Toolkit (MDT), you need to download and install the Windows Assessment and Deployment Kit (WADK). Since we will be using the latest Preview version of MDT (version 2013 Update 1 Preview as of this post), that means we need to use the Windows ADK for Windows 10 Technical Preview. The Windows 10 ADK is now available through the Windows Insiders program. Here is how to get it. Go to the Windows 10 hardware development site. Click “Download Windows 10 kits, tools, and code samples”. Sign in (or “Get Started” if you are not already an insider). Under the “For developers” and “Build great hardware” headers, click “Install the hardware development kits”. Under the “Customize, assess, and deploy Windows” header, click “Download the Windows ADK for Windows 10 Technical Preview”. After the download is complete, start the installation by running the adksetup.exe file. 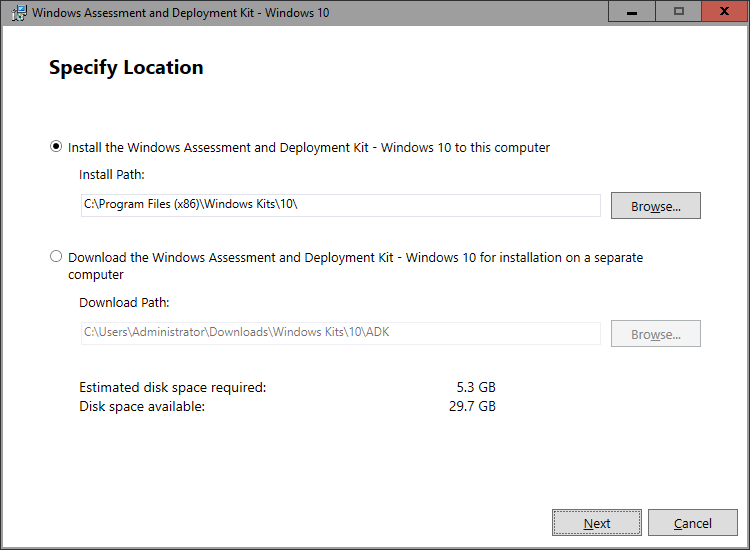 On the Specify Location screen, choose the location you want to install the Windows Assessment and Deployment Kit for Windows 8.1, and then click Next. 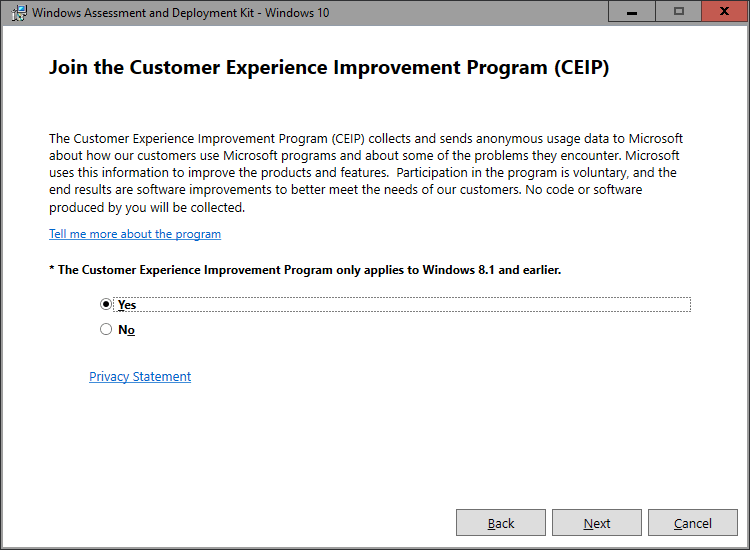 On the Join the Customer Experience Improvement Program (CEIP) screen, choose whether or not you want to join and click Next. IMPORTANT: Although initially you may hesitate to joining any program that sends data to Microsoft, it is actually recommended. The reason is, Microsoft uses this information on how their software is used, along with errors/crashes, issues, etc. to improve them. So if you think about it, the improvements in the interface, usability, functionality, etc. would not come about unless end users joined these programs and allowed Microsoft the opportunity to improve their products. That’s at least my thoughts. 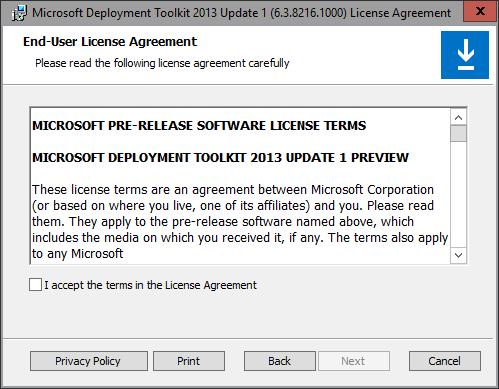 On the License Agreement screen, read the terms and then click Accept. On the Select The Features You Want To Install screen, obviously select the features you want, then click Install. If you just want to use the Microsoft Deployment Toolkit (MDT) for building and creating Windows deployment images, select the Deployment Tools. You may notice a few new features compared to the MDT 2013 version of the tool, namely: “Imaging and Configuration Designer (ICD)” and “Flashing Tools”. We will explore these in a later post. The Windows Assessment and Deployment Kit for Windows 10 will first download all the files required, and then initiate the installation. Now that the Windows Assessment and Deployment Kit for Windows 10 prerequisite has been installed, we can move onto the installation of the Microsoft Deployment Toolkit (MDT). 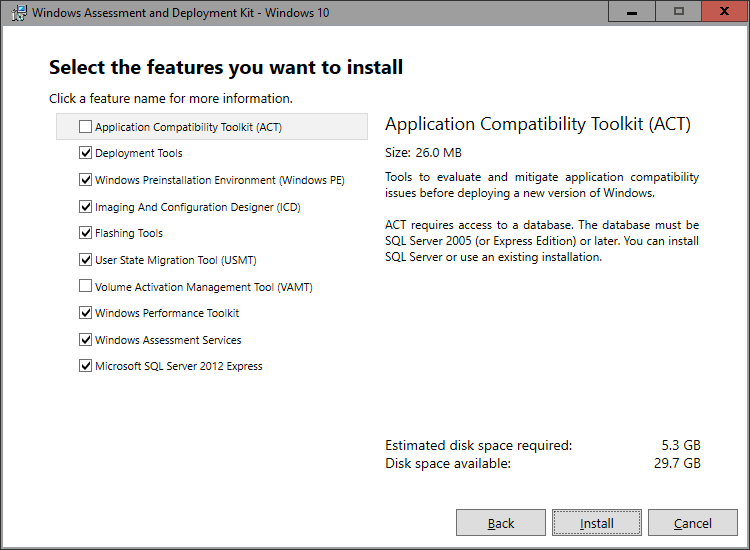 Now that we have the prerequisite (the Windows Assessment and Deployment Kit) installed, lets install MDT 2013. Start by downloading the Microsoft Deployment Toolkit (MDT) from the Connect portal here: https://connect.microsoft.com/ConfigurationManagervnext/MicrosoftDeploymentToolkit. 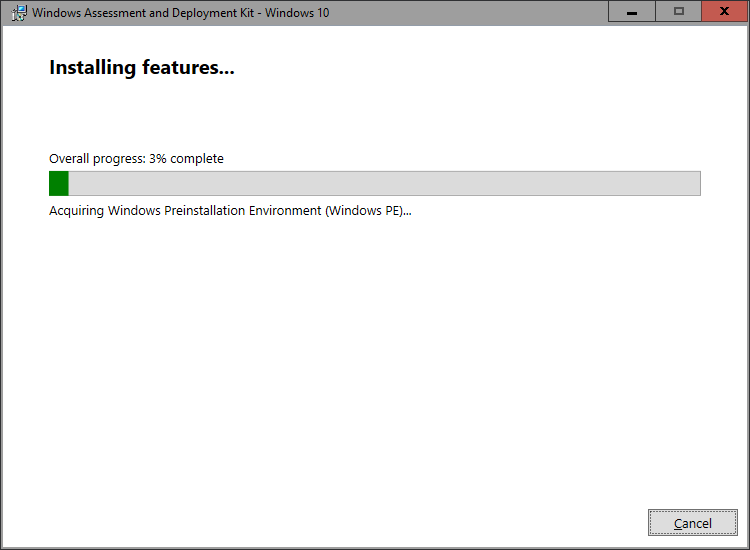 After the download is complete, start the installation by running the MicrosoftDeploymentToolkit2013_x64.msi file. NOTE: There are 2 different version of the Microsoft Deployment Toolkit installer, one for x86 and another for x64. If you are unsure which one to install, it is based on your OS architecture. 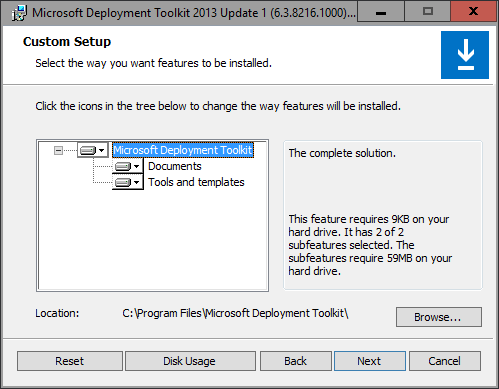 For example, I am installing the Microsoft Deployment Toolkit (MDT) on Windows Server 2016 Technical Preview 2, which is only a 64-bit Operating System. If you are installing it on an Administrator’s workstation (i.e. Windows 7/8/10), check if you are running either the 32-bit or 64-bit version. 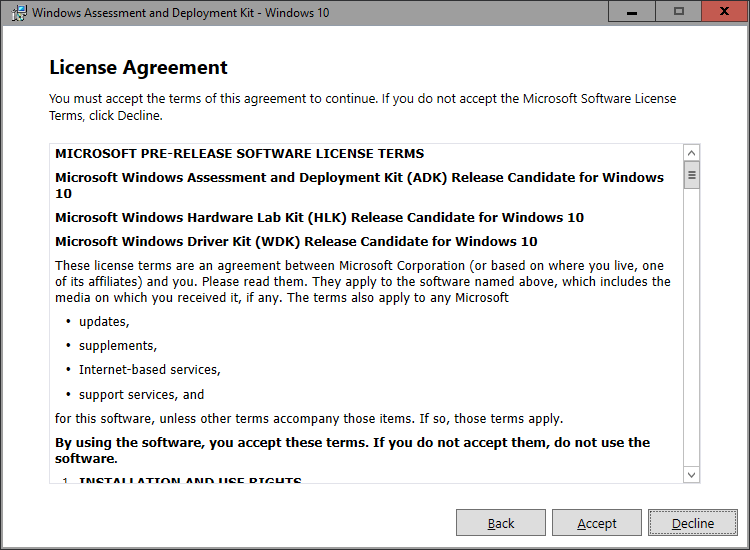 On the License Agreement screen, read the terms, and check the “I accept the terms in the License Agreement” checkbox, then click Next. On the Custom Setup screen, you can choose to install the documentation along with the tools and templates. You can also specify the location you want to install to. Make appropriate selections/changes and then click Next. 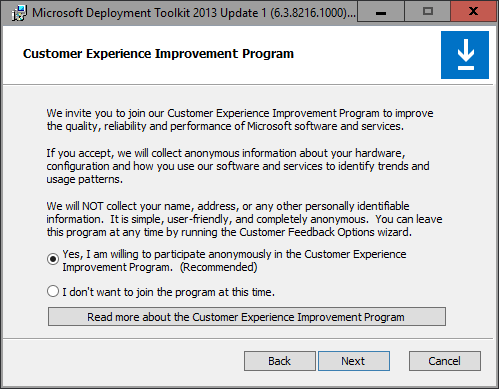 On the Customer Experience Improvement Program screen, choose whether or not you want to join and click Next. 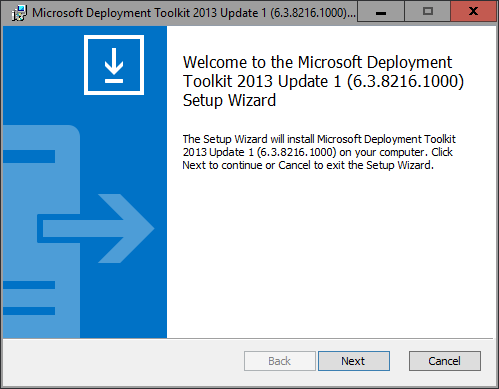 On the Ready To Install Microsoft Deployment Toolkit 2013 screen, click Install. 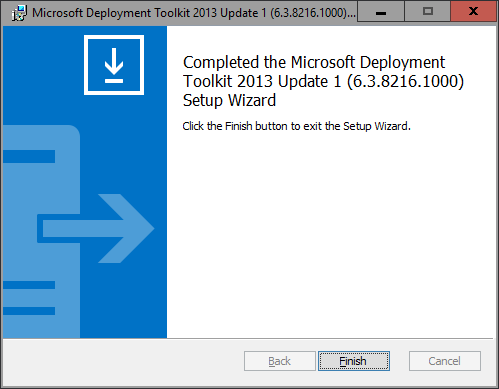 We now have finished installing the Microsoft Deployment Toolkit 2013. In another post, we will walk through the new feature: “Imaging and Configuration Designer (ICD)”.